Building on the success of the first edition, Christopher Mabey and Graeme Salaman are joined by John Storey in producing an even more comprehensive and thoroughly revised textbook. 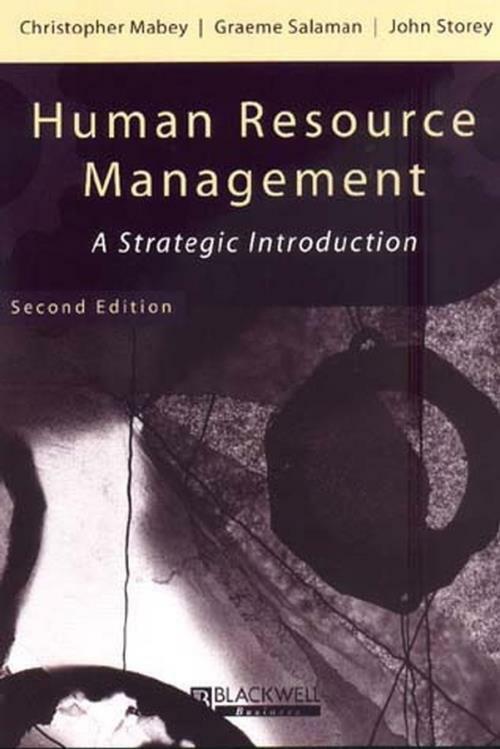 This volume engages with the essential themes and emergent ideas in strategic human resource management. There is increasing self–confidence about the potential benefit of intangible assets, notably human resources, contributing to the success of organizations. This revised text examines such claims in considerable depth and draws conclusions about the role of strategic HRM at the dawn of the new millennium. A distinctive strength of this volume is that it is a Set Book for one of the largest MBA programmes in Europe. It is a benchmark text for all advanced undergraduate and postgraduate level students of HRM, personnel management and change management. SHRM: A New Way of Managing? Part 1: SHRM: A New Way of Managing?. 1. The Nature, Origins and Implications of SHRM. 2. Linking Organizational and Human Resource Strategies. 3. SHRM in a Global Context..
5. Training and Development Strategies. 6. International Human resource Strategies..
7. Organizational Structuring and Restructuring. 8. Beyond Organizational Structure: The End of Classical Forms?. 11. Promoting Learning in Organizations. 12. Managing the Process of Training and Development..
13. Change Management Strategies and Assumptions. 14. Change Management Choices and Outcomes. 15. The Role of Culture in Organizational Performance. 16. The Possibilities of Culture Change..
18. SHRM – The Redefining of People and Organizations.